I don’t normally write about perfume, even though I love it, because I don’t collect it. But this past August I had an occasion to discuss perfume and burlesque with a wonderful woman who knows a great deal about both. The woman I’m talking about is none other than legendary burlesque queen, Betty “Ball of Fire” Rowland. I met her because she was a special guest on Esotouric’s “Hotel Horrors and Main Street Vice” tour. She began her professional dancing career as a Minsky’s girl in New York city; and she may have stayed there if it hadn’t been for a crackdown on the burlesque houses beginning in 1935. The citizenry and, perhaps even more importantly, Mayor LaGuardia, considered burlesque a corrupt moral influence. The mayor and the citizens groups couldn’t shut Minksy’s down without a good reason — there would need to be a criminal charge against Abe Minsky. At last, in 1937, a dancer at Minsky’s was busted for working without her G-string and the law stepped in. New licensing regulations would allow the burlesque houses in New York to stay open, provided that they didn’t employ strippers! Not surprisingly, that bit of legalese put a bullet through the heart of burlesque in the city. Betty and her troupe of dancers headed west to begin a limited engagement at the Follies Theater on Main Street in Los Angeles. 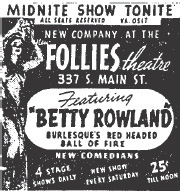 It may have started as a limited engagement but Los Angeles audiences loved Betty and she would continue to dance at the Follies for about 15 years. Before she was dubbed the “Ball of Fire”, Betty was known as the “littlest burlesque star”. That appellation may have described her stature (she is very petite), but “Ball of Fire” captured her spirit. Is she still a ball of fire? You bet! Because I had an opportunity to chat with her, I decided that rather than ask her to reminisce about celebrities she’d known, or places she’d worked, I’d ask her if she’d had a signature scent, particularly something she’d worn when she performed. She seemed a little surprised by the question, saying she’d never been asked that before, but she responded instantly. 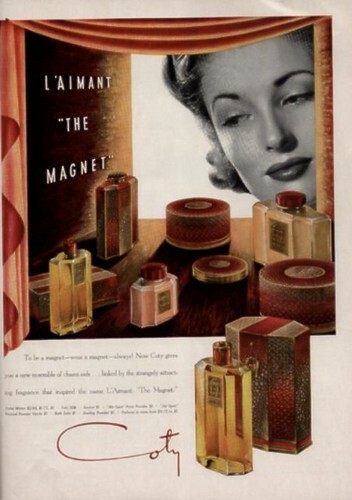 Her favorite fragrance had been Coty’s L’Aimant; and it was part of her act! She told me that before she appeared on stage she’d spray a liberal amount of the cologne all over herself so that when she “worked the curtain” the scent would waft over the first few rows. I told her that I thought it was absolutely brilliant of her to have conceived of using a fragrance in such a creative way. There has been an enormous amount of scientific research done on olfactory memory; but you don’t have to be a scientist to know that certain aromas trigger powerful personal memories. I cannot smell leaves burning without recalling my midwestern childhood. As far as I was concerned, autumn had officially arrived when leaves, raked into neat piles, were burned in nearly every yard in my neighborhood. I’ll bet that there were men who saw Betty perform who subsequently carried with them forever the memory of her perfume. I wonder how many wives and girlfriends received gifts of L’Aimant from those men over the years; and I also wonder if the men knew why they’d selected that particular perfume at a counter crowded with choices. Betty lamented that Coty had long ago discontinued her favorite scent — but if you know where to look you can still find a vintage formulation of the famous floral. I’ve ordered a bottle for Betty, and I hope it prompts her to relive some of her most precious memories. If you’re interested in seeing one of Betty’s performances, all you need to do is to go to YouTube. I’ve also written a little different story about Betty for In SRO Land.